What is This Restless Feeling? Find your intrepid partner and escape from the endless Lovecraftian Dreamscape full of maddening visions of terror, in new cooperative card game Mad Love by Imp House LLC. 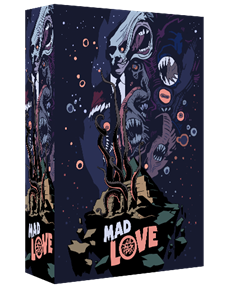 Mad Love is a Lovecraftian cooperative pocket card game of memory and deduction for 2 people played with a deck of just 18 cards. You and your partner are separated and lost in a nightmare world; you cannot hear or see each other. This means no verbally sharing information or giving visual hints to your partner. The only way to convey information to one another is by adding and dismissing cards, which represent dreams, in and out of the central area of play, a 2x2 grid called the Dreamscape. The game is currently at its final days on Kickstarter, so don't miss it out!